Abstract. 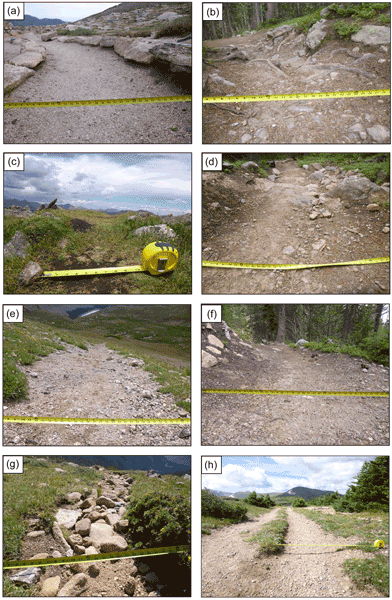 This paper examines impacts of increased visitation leading to human trampling of vegetation and soil along several trails in Rocky Mountain National Park (RMNP) to understand how abiotic factors and level of use can influence trail conditions. RMNP is one of the most visited national parks in the USA, with 3.3 million visitors in 2012 across 1075km2 and 571km of hiking trails. 95% of the park is designated wilderness, making the balance between preservation and visitor use challenging. This research involves the application of trail condition assessments to 56km of trails to determine prevailing factors and what, if any, connection between them exist. The study looked at a variety of inventory and impact indicators and standards to determine their importance and to develop a baseline condition of trails. The data can be used for future comparison and evaluation of development trends. We found that trail widening (mean trail width 88.9cm) and soil loss (cross-sectional area 172.7cm2) are the most visible effects of trail degradation. Further statistical analyses of data identified the role and influence of various factors (e.g., use level and topography). Insights into the influence of these factors can lead to the selection of appropriate management measures to avoid or minimize negative consequences from increased visitation. 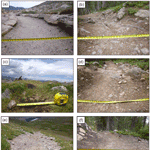 How to cite: Svajda, J., Korony, S., Brighton, I., Esser, S., and Ciapala, S.: Trail impact monitoring in Rocky Mountain National Park, USA, Solid Earth, 7, 115-128, https://doi.org/10.5194/se-7-115-2016, 2016.